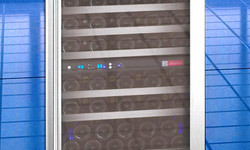 The all-new Allavino FlexCount Series VSWR121-2SSRN Dual Zone Wine Cellar Refrigerator offers elegant built-in or freestanding storage of up to 121 bottles of red and white wine, and is loaded with special features that make it easier than ever to store your collection in its optimum conditions. It features new cutting-edge shelves that are thin enough to allow more space between shelves than you will find in similarly sized wine refrigerators, allowing you to to store larger bottles without sacrificing bottle capacity. 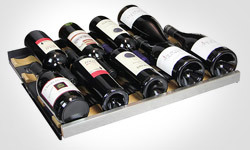 Each shelf is constructed of durable metal to provide reliable stability and prevent sagging over time, and has a stainless steel front and wood slats that cradle your bottles to help minimize harmful vibration. 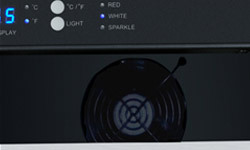 This refrigerator is controlled using a digital display with user-friendly push button controls that make it easy to individually monitor and adjust the temperature of each zone. 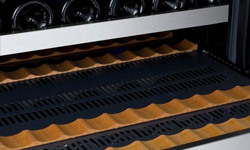 The VSWR121-2SSRN features 11 shelves that can hold up to 11 bottles each for a maximum capacity of 121 bottles. The maximum capacity can be reached with many different bottle sizes and is only affected when adding in larger Pinot or Champagne bottles. 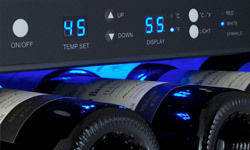 Store both red and white wines with this dual zone unit, which features a digital display with easy-to-use push button controls that allow you to easily adjust each zone's temperature. My mother was absolutely love it! I brought this for my Mother and she absolutely loves it. She says it keeps her wine at the perfect temperature and it is very quiet like it’s not even there. I love the cooler! It is the perfect size to fit in the space I had. Both zones hold the temperature quite well. The lighting and glass door really make this look nice. it's very sturdy. we spaced out bottles and they are all staying chilled at the same temperature. this is a great chiller. it looks really big online but its a great size. fits perfectly in the space we needed it to. it's very sturdy. we spaced out bottles and they are all staying chilled at the same temperature.